Short messaging services like Whataspp, Telegram etc might have taken the communication industry by storm but email remains the backbone of internet messaging. Despite the rise of short messaging apps, email is still a big player. Owing to the evolution of email services, Google has stepped ahead of others by allowing users to login to Gmail with Yahoo and Outlook (formerly Hotmail) accounts. While many email clients are still figuring out to keep intact the fluctuating numbers of users, Gmail now has one more reason to consider it when it comes to choosing the right email service provider for your work and personal use. Gmailify is a features that comes within Gmail’s Android app. 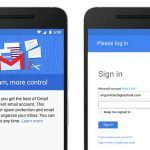 With this new feature, not only you can login to Gmail using your Yahoo or Outlook account, you can also get all the features a standard Gmail account comes packed with. Gmailify also comes with the much useful features like spam protection and Google Now integration. If you have a Yahoo or Outlook account that you don’t want to get rid of but still want to enjoy Gmail like features at the same time, Gmailify is your answer. To activate the service, you can go to your Gmails Android account settings and turn Gmailify option on. The feature is only available for Andriod users for now. There is no news about its availability to other platforms like iOS and Windows.